The 1909 death of George Emory “Tube” Swindle at Buffalo Lithia Springs, VA was noted in the Atlanta Constitution. Although he died far from home, George Emory Swindle lived most of his fifty-two years near Rays Mill (now Ray City), Georgia. G. E. Swindle, Valdosta, Ga.
August 18. -(Special. )- G.E. Swindle, a prominent and wealthy farmer of this county [Lowndes], died yesterday morning at Buffalo Lithia Springs, Va. where he had gone for his health. Mr. Swindle had been a sufferer from Bright’s disease for several years. Recently his condition became much worse. Two of his sons went to his bedside on Saturday, and were with him when the end came. L.C. Swindle, a merchant of Valdosta, and J. N. Swindle, also of this city, are his sons. He leaves four other sons and his wife, who live on the home place in Berrien County. The deceased was 52 years old and had lived in Lowndes county many years. He owned much valuable property and was one of the wealthiest farmers in the county. 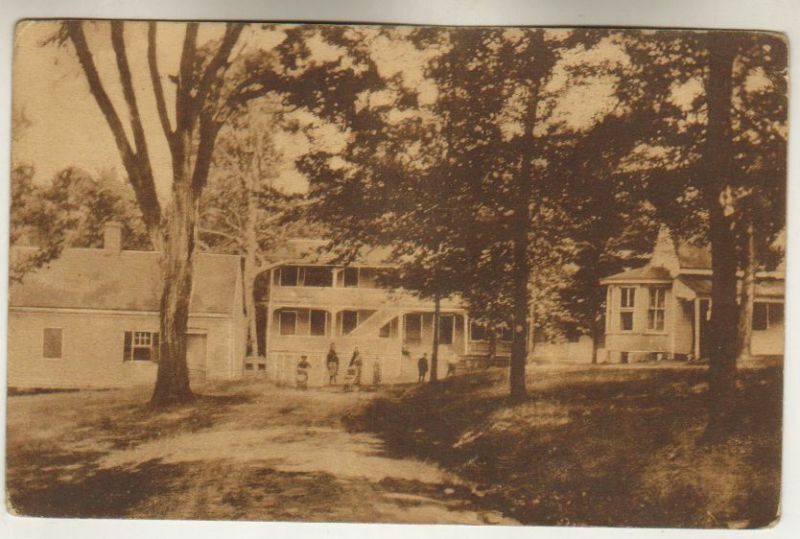 Solomon’s Temple, one of three hotels at Buffalo Lithia Springs of Virginia. George Emory Swindle was born April 5, 1859 in Liberty County, GA, a son of James Swindle and Nancy Jane Parker, and brother of Sheriff William Lawrence Swindle. Swindle moved with his family to Berrien county GA some time in the 1860’s. The Swindle farm was located about two miles southwest of Ray’s Mill, GA [now Ray City, GA] on Possum Creek road. At age 18, on December 13, 1877, George E. Swindle married Margaret M. Futch. The couple made their home next to his father’s place on the Berrien-Lowndes county line, and for the next thirty years raised crops and children. While George Swindle prospered as a successful planter, he suffered from Bright’s Disease. A succinct description and historical context of this condition is provided by the writers, researchers, and editors at the www.wisegeek.com website. Bright’s Disease is an older classification for different forms of kidney disease. It was named after Dr. Richard Bright, who described the condition in the early 19th century. Lack of understanding of kidney function naturally meant that several different conditions could be considered Bright’s Disease. These include inflammation of the kidney, commonly called nephritis. Inflammation may be the result of too much protein being shed through the kidneys, called proteinuria, or hematuria, which causes blood in the urine. As well, Bright’s Disease might describe kidney failure due to high blood pressure or retention of fluids. Those symptoms most commonly associated with Bright’s Disease were intense pain on either or both sides of the lower back. Fever might be present and intense edema, or retention of fluids, might cause the extremities to appear extremely swollen. Breath could be labored and difficult, particularly if kidney failure caused fluid to accumulate in the lungs, or was caused by metastasized cancer. Analysis of urine in diagnosing Bright’s Disease might show extremely cloudy, dark or bloody urine. Those affected might also find eating difficult, or might have periods of nausea or vomiting. All of the symptoms meant a very serious disease, which was usually not treatable, particularly in the 19th century. Some types of kidney inflammation might be treated if they were not indicative of progressive kidney illness. Some people suffered attacks that could respond to early diuretics or laxatives. Physicians might also propose special diets, but this was still relatively uncommon. A quack treatment for Bright’s Disease that became highly popularized in the 1800s was the use of “Lithia Water”. In 1921, the American Medical Association published a volume on Nostrums and Quackery that included a brief history on the emergence of the lithia water fallacy. Years ago, Alexander Haig evolved the theory that most diseases are due to uric acid. The data on which he founded his theory were not corroborated by scientific men, and investigation showed that his methods were unreliable. In spite of the fact that Haig’s theories are utterly discredited, and have been for years, the uric acid fallacy still persists, although it is now largely confined to the public. Shrewd business men, especially those who are more intent on making money than they are concerned with the manner in which that money is made, owe much to Haig’s theory. As a business proposition, uric acid has been one of the best-paying fallacies on the market—and possibly still is. Contemporary with, and to a certain extent a corollary of, the uric acid fallacy was another, vie, that lithium would eliminate uric acid. This.at once gave a good working principle for the proprietary men. Uric acid, we were told, causes disease; lithium, we were also told, would eliminate uric acid; therefore, lithium is the new elixir of life! Could anything be simpler? 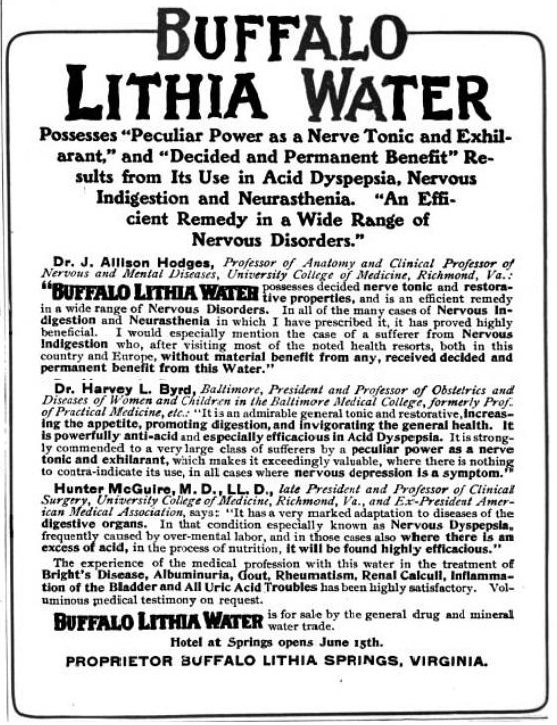 An advertisement for Buffalo Lithia Water and the hotel at Buffalo Lithia Springs, VA promised to cure Bright’s Disease. George Emory Swindle died August 17, 1909 at Buffalo Lithia Springs, VA. 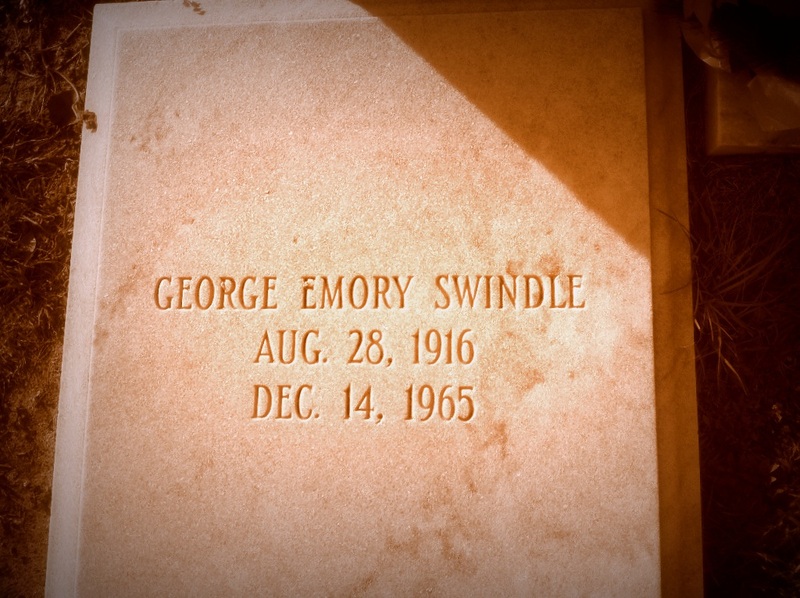 Grave of George Emory Swindle, Beaver Dam Cemetery, Ray City, GA. Eventually, medical evidence would show, as in this case, that mineral water was not an effective treatment for kidney disease. Although the Food and Drug Administration would force mineral water companies to cease false therapeutic claims, Buffalo Springs Mineral Water continued to be sold until 1949 . Those with progressive kidney disease labeled as Bright’s Disease usually did not respond to treatments, which might also include bloodletting, and the treatments above. Those unresponsive to treatment were simply unlucky to be born in a time when medical knowledge was minimal. Current treatments for kidney failure of various types, like kidney transplant or dialysis, can significantly lengthen the lives of those who would once have been diagnosed with Bright’s Disease. Bright’s Disease may be used in reference to Dr. Richard Bright, or one may find reference in literature and in older biographies, or medical texts. Today medical researchers and practitioners know that an all-inclusive label such as this obscures appropriate methods for cure, since not all kidney disease can be treated in the same manner. However, most honor Dr. Bright for at least localizing these diseases to the kidneys and pointing the way toward further research.